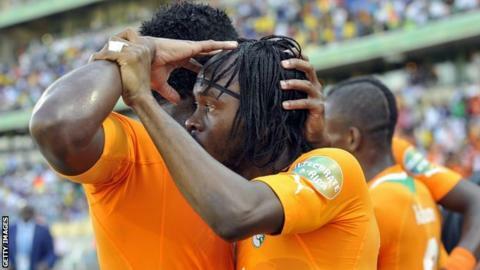 Ivory Coast booked their place in the Africa Cup of Nations quarter-finals after beating Tunisia. The Elephants deservedly took the lead when Gervinho clinically finished off a superb one-two with Lacina Traore. Manchester City midfielder Yaya Toure made it 2-0 with a stunning curler into the far corner from 20 yards. And substitute Didier Ya Konan put further gloss on the Ivorians' victory when he rolled the ball home with virtually his first touch. The result means Ivory Coast lead Group D on six points and cannot finish lower than second. Tunisia remain on three points and will contest the final qualification place from Group D with Togo, after they beat Algeria 2-0. Having failed to hit top form in their opening 2-1 win against Togo, questions were being asked about whether an ageing Ivory Coast team would be able to finally win another title after losing on penalties in the 2006 and 2012 finals. Didier Drogba, who missed a crucial penalty against Zambia in the final last year, was dropped for the first time in his international career - a huge signal of intent from coach Sabri Lamouchi. And, right from the off, the Elephants looked determined to prove their doubters wrong as they set about Tunisia, who looked overawed and nothing like the team that beat Algeria in their opener. Salomon Kalou headed wide from Romaric's chipped pass, Lacina Traore also nodded off target from another Romaric delivery and then Kalou smashed over from only 10 yards. It took a great save by Moez Ben Cherifia to deny Traore after the impressive Gervinho had slipped his team-mate in but inevitably the Tunisia keeper was soon picking the ball out of his net. Gervinho played a great one-two with Lacina Traore, whose return flick was exquisite, and the Arsenal forward cracked in a smart finish into the far corner - his second goal of the tournament. A glimmer of hope then shone for Tunisia as Fakhreddine Ben Youssef was almost in on goal twice, the second time he was denied by Cheick Tiote, who cut out a great cross with an outstretched leg. The Ivorians soon responded to snuff out any potential fightback by the Tunisians, though, and were unlucky to not win a penalty when Khalil Chammam seemed to move his arm towards the ball to prevent a cross. Tunisia threatened to compete a little more after the break but there was always the impression that Ivory Coast could step up a gear if needed. And Traore should have done better with a chance to head in, getting his position all wrong as the ball bounced off the back of his head. A rare attack by Tunisia ended with Saber Khelifa poking the ball wide under pressure from Sol Bamba before Youssef Msakni made a hash of a volley. On came Drogba after 67 minutes as Ivory Coast looked to kill the game. But it was Tunisia who might have scored next when Khelifa had a chance to equalise with an acrobatic volley that was saved by Boubacar Barry. That was the Carthage Eaghles' last chance of salvaging anything from the game as Yaya Toure wrapped up the points when he curled in a shot from the edge of the box. And substitute Ya Konan made an instant impact when he used his first touch to control the ball on the edge of the box and the second to stroke it home. "Why didn't I play Didier Drogba? Because it seemed to me that the 11 players I picked were the best to overcome this good Tunisian side. "Until the 25th minute [and Gervinho's opener] we hadn't entered into the game. The goal that we conceded was due to a lack of focus. "Up to the 85th minute we tried our best and were quite threatening at that stage"